There are pros and cons to traveling in each of Canada's four seasons. The best time to visit Canada is during the fall months, from September through November. The weather has cooled down but is still comfortable, the summer crowds have left, prices drop, and changing fall foliage provides a beautiful backdrop for a vacation. Also, fall celebrations such as pumpkin, apple, and wine festivals are in full swing and give visitors a chance to visit slightly out of the way farms and orchards. Generally, the summer months are the most popular time to visit, but no matter when you choose to travel to Canada there will be some advantages (perhaps cheaper flights and hotels, fewer crowds) and some disadvantages (cold weather, fewer hotel options). Of course, Canada is a wide-ranging country with vastly different economic and climate conditions. Be sure to understand that any month in Vancouver is quite a different experience than the same month in Toronto or Montreal. Don't assume all of Canada has the same weather. For example, Vancouver in winter rarely gets a lot of snow or sub-zero temperatures, whereas Montreal is freezing cold beginning in December, with multiple massive snowstorms throughout the winter season. Winter usually spans December through February but can last well into April in some parts. Winters are cold and long through much of the country, except for the coastline of British Columbia. Elsewhere, such as Eastern Canada, below-zero temperatures and snowstorms with snowfall greater than 8 inches are not uncommon. On the west coast, spring arrives by the end of February, ringing in the last of the freezing temperatures. Snowfall can continue at the higher elevations, especially at ski resorts like Banff or Whistler, through May. By June, summer's arrived, bringing with it high humidity and hot weather, especially in the central and eastern parts of the country. The summers on the West coast are typically much cooler. In the far reaches of Canada's north, many cities, like Whitehorse or Edmonton, see daylight for 17 to 20 hours. Be sure to bring insect repellant in the summer months, too. Fall weather throughout Canada showcases cooler temperatures and less humidity than the hotter days of the summer months. Vancouver, which can be quite wet throughout most of the year, experiences its driest month in September. Peak season in Canada typically takes place during the summer, especially late June through September, when the weather is warm, and schools are out of session. While more rural parts of Canada still see fewer crowds, be sure to book your visit early if you're heading to popular tourist destinations like Vancouver, Montreal, or Toronto. Additionally, many of the country's national parks experience swells of crowds during summertime holidays, and rates for accommodation and travel rise accordingly. Canada's sheer size and diversity mean that the country hosts unique and lively holidays and festivals throughout the year. Some popular events include the Québec Winter Carnival, a two-and-a-half-week long celebration of winter; Winterlude, held in Ottawa, where guests can skate along the world's largest ice skating rink; and Calgary Stampede, a rodeo that got its start as a quaint agricultural fair and now draws in competitors from around the world. On the West Coast, don't miss the Pacific Rim Whale Festival, a celebration of the more than 20,000 whales that migrate along Canada's coastline each year. All of the country is cold during January, but it doesn't make it any less of a popular time to visit. Head to Ottawa where you can glide along the Skateway, the world's largest natural ice rink. The Niagara Falls Winter Festival of Lights in Ontario kicks off in November but runs throughout January. This spectacular light show includes a three-mile route of lighted displays, plus fireworks over the falls. Each year, Toronto hosts Winterlicious, a restaurant festival where some of the city's best chefs serve affordable prix-fixe menus. February is the coldest month in Canada, but winter festivals—and ski season—are still in full season. If you can brave a little chill, it's an excellent month to score discounts on lodging and travel. Festival du Voyageur celebrates Saint-Boniface's French-Canadian heritage. This week-long February festival includes snow sculptures, dog-sledding, and skating. Québec's Winter Carnival runs for 17 days through February. Since 1894, locals and visitors alike have flocked to celebrate the area's cold, snowy winters. March is still cold, and thus, a slow season for travel— except for spring break, which usually occurs toward the end of the month. Many visitors to Canada during March come to ski or visit one of the country's famed sugar shacks for maple syrup tasting. Spring arrives earlier along the West Coast, and Vancouver holds its annual cherry blossom festival each year in March. When temperatures begin to rise, maple syrup production ramps up. Quebec and Ontario host celebrations of this sweet treat. April is both a warm and wallet-friendly time to visit. 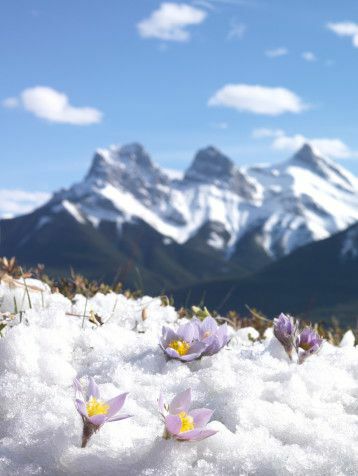 Ski season is still going strong on Canada's highest mountains, but the rest of the country is beginning to experience spring, along with its colorful blooms. Weather can be unpredictable, so pack a rain jacket. Every April, Toronto hosts Hot Docs International Documentary Film Festival. The celebration of more than 100 documentaries is North America's largest festival of its kind. If you feel like going for a run, join the Vancouver Sun Run. This 10-kilometer race is Canada's largest, and the second-largest in North America. By May, tulips and daffodils are entirely in bloom and weather has stabilized. Luckily, there are still plenty of great travel deals to be had before summertime's rush! Some rain is a possibility, but it's still easy to enjoy plenty of time outdoors. Victoria Day is a national holiday in Canada that falls on the Monday before May 25. Expect governmental agencies, schools, and banks to be closed. There's usually a small swell in domestic travel at this time as well. The Canadian Tulip Festival is held over 10 days in Ottawa. Activities include a tulip market, art exhibitions, and more. June is warm in Canada, but not yet super humid. Popular tourist destinations and national parks will begin to get more crowded. If you're camping or staying at a cottage, bring plenty of bug spray, as pesky black flies are everywhere throughout Canada in the early summer. The Banff Summer Arts Festival brings music, film, theater, and dance performances to Banff, Alberta, every summer. At the end of June, the Festival International de Jazz de Montreal brings thousands of jazz enthusiasts from around the globe during its week-and-a-half run. July is popular, and hotel and flight prices will reflect that. Despite the hot and humid weather, expect national parks and other city attractions to be extremely crowded. July is also a popular month for some of Canada's biggest festivals and events. July 1 is Canada Day, a celebration similar to July 4 in the U.S. Expect fireworks and other patriotic festivities. Grab your cowboy hat and spurs and head on over to the Calgary Stampede, also called the Greatest Outdoor Show on Earth. Each year, more than a million people visit Calgary to partake in this 10-day rodeo and celebration of the ranching heritage held every July. From its humble beginnings in 1980, the Edmonton Folk Festival has grown to be one of the world's premier folk festivals. Held each August, the festival's lineup is always outstanding and ticket prices stay reasonable. Temperatures cool down in September as stunning fall foliage starts creeping in, making the month a great time to visit. Labour Day weekend, held on the same weekend as the U.S. equivalent, is a popular travel weekend so expect higher rates and heavier crowds then. The Vancouver Fringe, held every September, celebrates theatre of all kind. The Fringe presents live, unjuried performances and artists receive 100 percent of regular box office revenues generated during the festival. The Toronto International Film Festival takes place in September, screening more than 375 films and hosting nearly 500,000 people. Fall foliage peaks in early October. October is also the month of Canadian Thanksgiving, which is celebrated but not nearly to the extent of its American counterpart. Oktoberfest, the equivalent to the famed German festival, runs for two weeks in Kitchener-Waterloo, Ontario. The weather cools down significantly in November, but it's still possible to spend some time outdoors. Ski season also ramps up in November. This is a great month to find low-season travel deals. Most of Canada's major cities host Santa Claus Parades in November. These family-friendly parades showcase holiday floats and usually have activities for children. Ottawa hosts the two-day Ottawa Food & Wine Show the first week in November. The event includes pouring more than 1,400 wines and spirits and draws 25,000 visitors. The weather is cold and there will probably be snow, but if you're prepared, you can still enjoy Canada's cities and lots of outdoor activities come December. Before and just after Christmas offers visitors some of the best opportunities for airfare and hotel bargains—especially if you like to ski. December 26 is Boxing Day, a popular government holiday that is also one of the biggest shopping days in Canada.